Abu Dhabi National Oil Company (Adnoc) is significantly boosting its downstream capabilities, investing $45 billion, alongside partners, to capitalise on state-of-the-art facilities in Ruwais, to the west of Abu Dhabi city, to create a plug and play manufacturing cluster and industrial hub, said Dr Sultan Ahmed Al Jaber, UAE Minister of State and Group CEO of Adnoc. When fully operational, the complex will be the world’s largest integrated refining and petrochemicals complex and will act as a catalyst for GDP growth, skilled jobs and economic diversification within the UAE, he said. 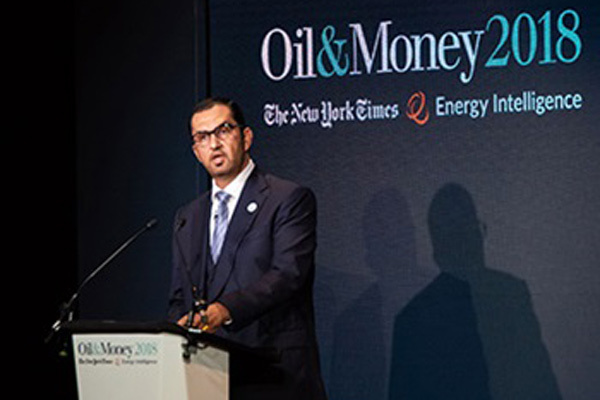 He was speaking in London at the 39th Oil and Money Conference, co-hosted by The New York Times and Energy Intelligence. Dr Al Jaber said there are opportunities for expansion, investment and growth in the oil and gas industry, as demand for energy continues to rise, particularly from the high-growth economies of Asia. He said global demand for oil is reaching record highs and that by the end of this year, much sooner than expected, the world will see the historic milestone of consuming 100 million barrels of oil per day.